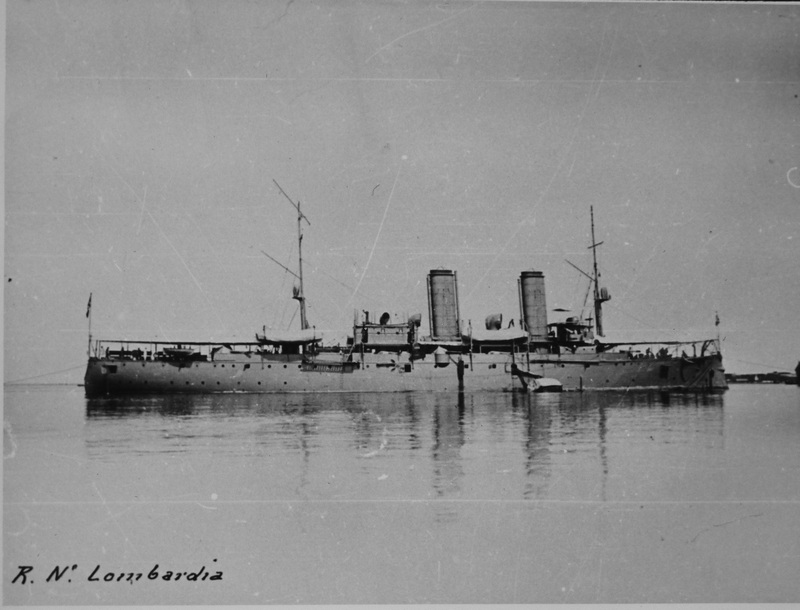 Evaristo Caretti's ship, the Italian light cruiser "Lombardia", stationed for 3 years on the China coast during thd Boxer War. 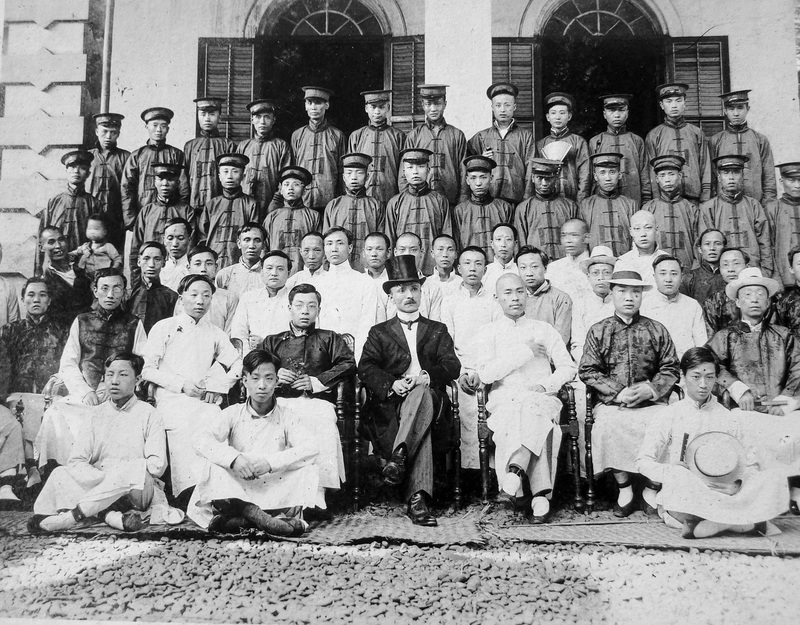 Soochow (Suzhou), Anhui Province , 1906-08 EC (Evaristo Caretti) a young beginner, sits demurely next to his authoritarian- looking Director, surrounded by the entire Post Office staff. 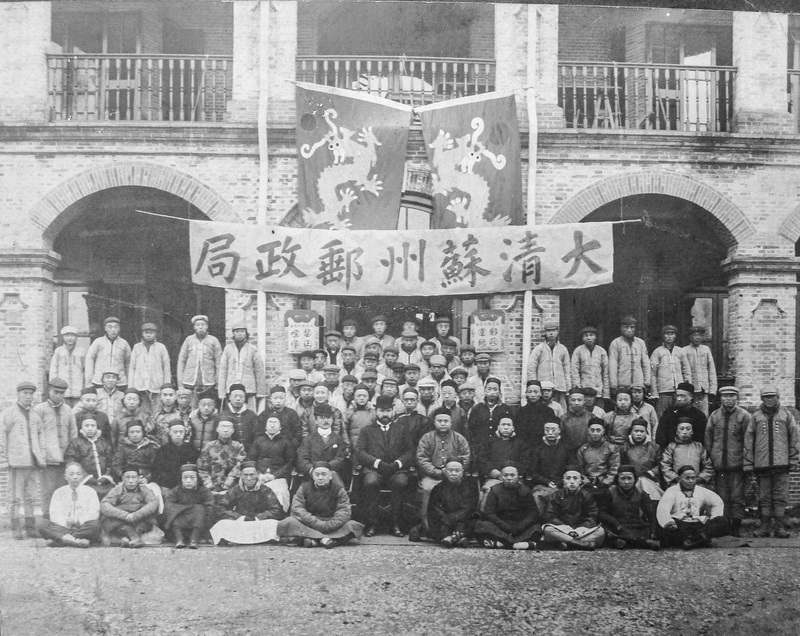 The banner overhead reads: "Great Ch'ing (Dynasty) Soochow Post Office". Two smaller notices on the wall announce: Right: "Important seat of the Postal Service" Left: "Noise-making forbidden"
1910-14 - Chungking (Chonqing), Szechuan (Sichuan) province. 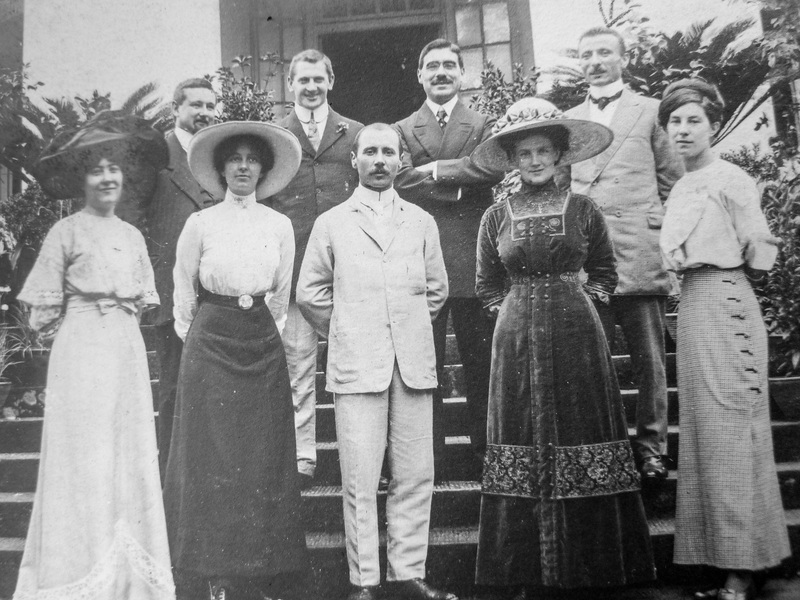 EC, local Director of Posts, with all his staff. 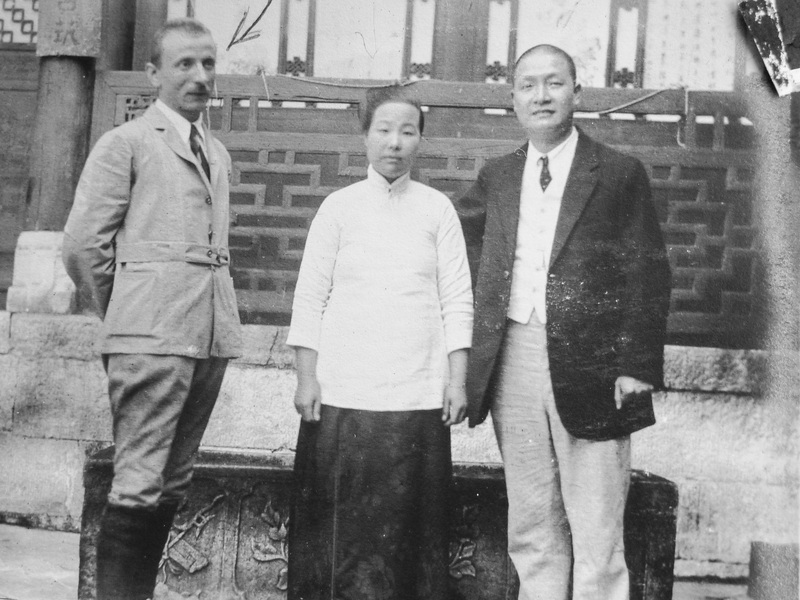 1910-14 - Chungking (Chongqing), Szechuan (Sichuan) province. 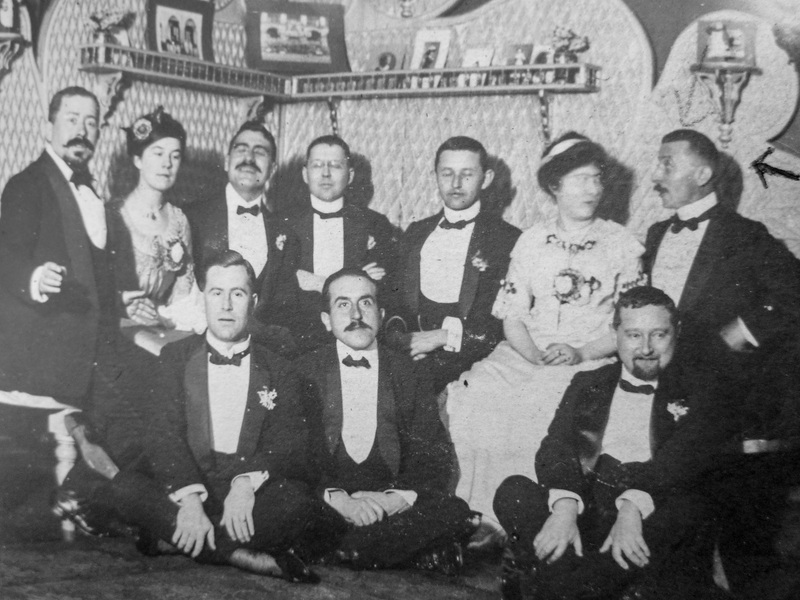 EC (top left, arrow) at a dinner party. 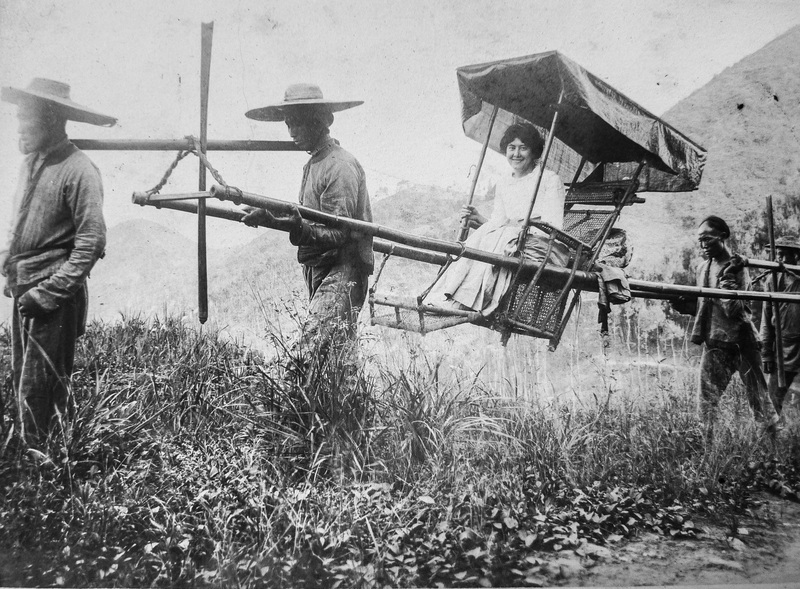 Thousands of miles up-river from the main coastal cities, Chungking was at the time a very isolated destination for the small group of expatriates living there. Persons of different nationalities reacted by being gregarious and associating frequently. 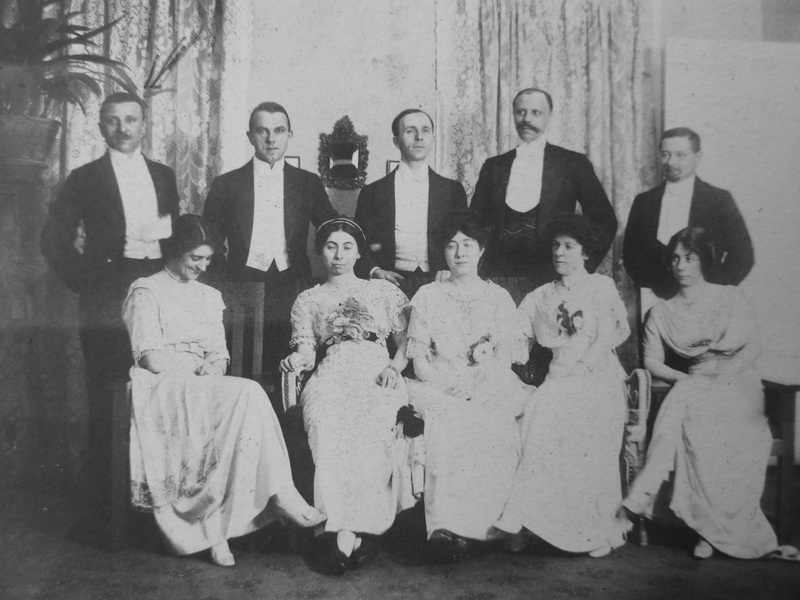 Formality and dress etiquette were the rule. 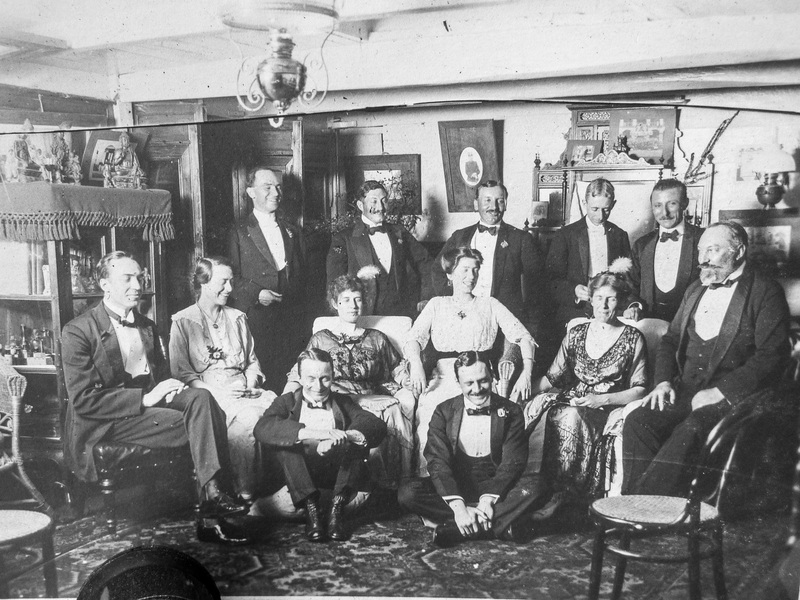 Black or even white ties were insisted upon at evening parties. 1910-14 - Chungking (Chongqing), Szechuan (Sichuan) province. China - - USA Friendship Day . 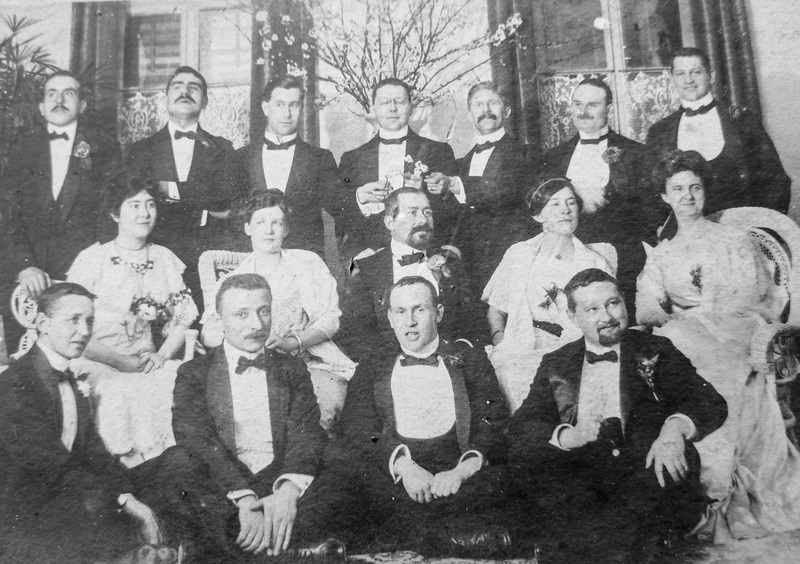 EC front row , far right. 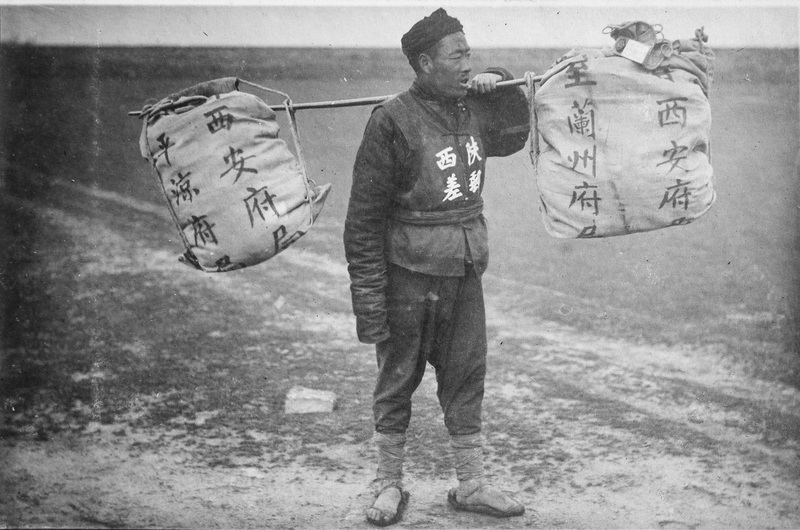 1910-12 - How mail travelled in China in those days Character's on man's breast read: " Shaanxi Province Postman" Characters on 2 mail sacks read "From/to Xian (Shaanxi prov.) from/to Lanchow (Kansu prov.)" 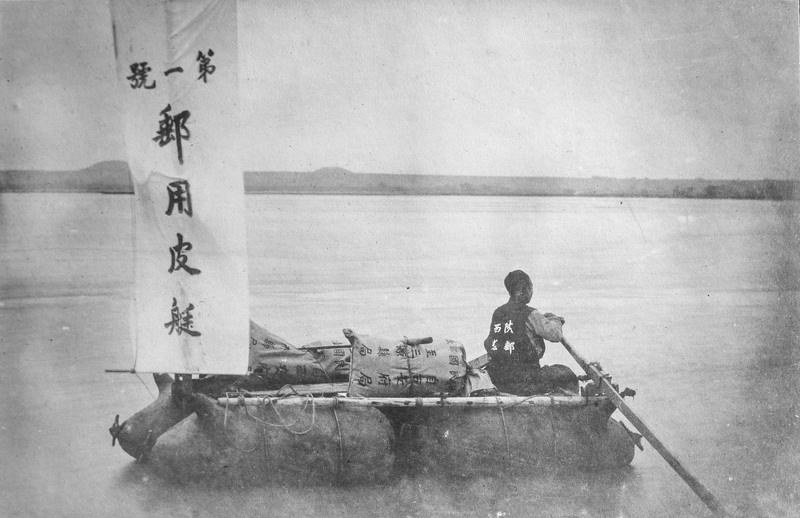 1910-12 - How mail travelled in China in those days he sign reads " Shaanxi province N° 1 skin boat for postal use"
1914 -15 - Changsha (Hunan province) A party hosted by EC.at his home aboard a large junk or "lorcha" at anchor on the Hsiang (Xiang) river. 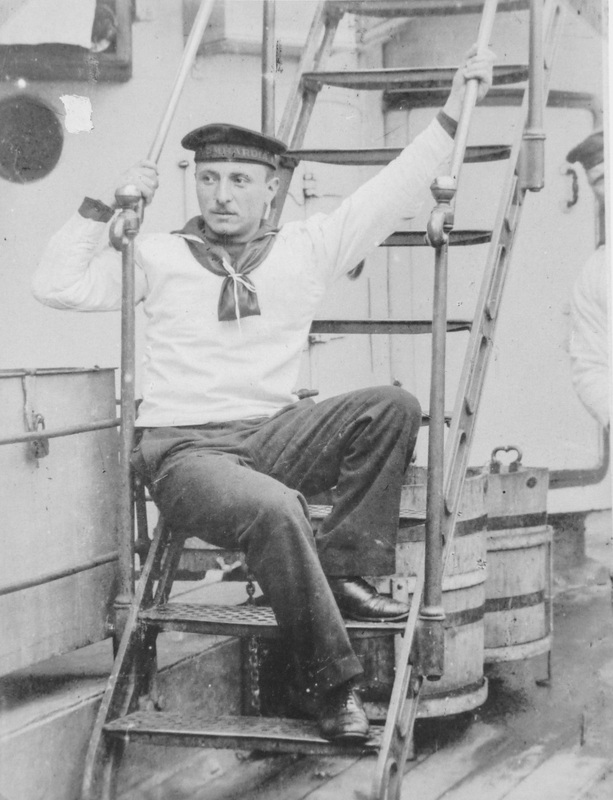 This craft proved adequate, whereas suitable accomodation and sanitary conditions ashore were lacking. 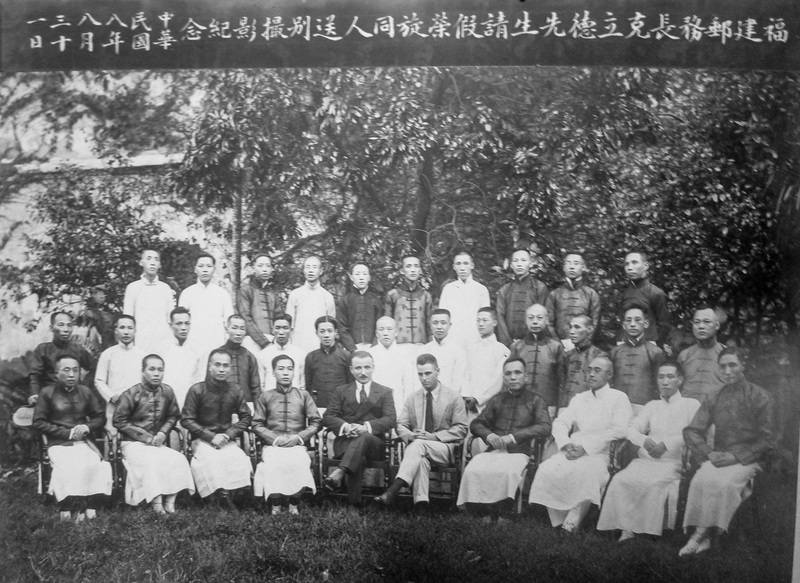 1918-19 - Foochow (Fuzhou), Fukien (Fujan) province. 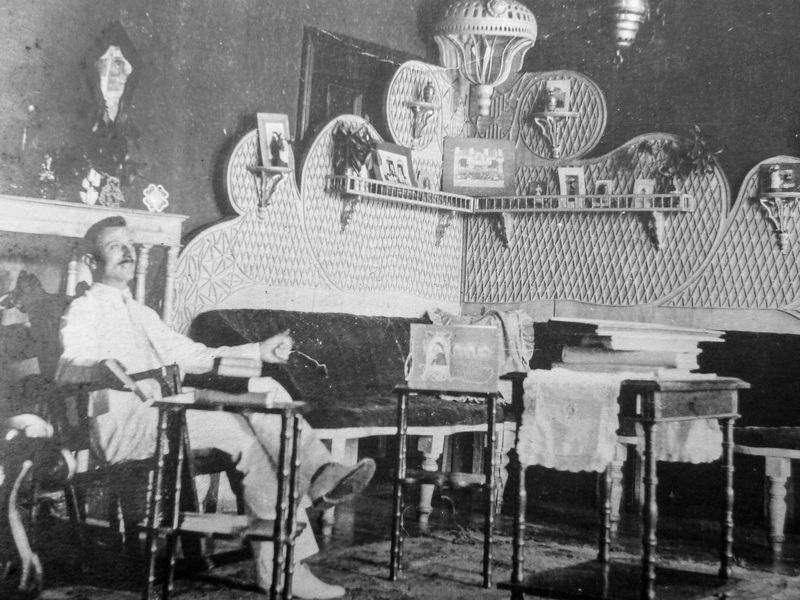 EC's residence, when Director of Posts for Fukien (Fujan) province. 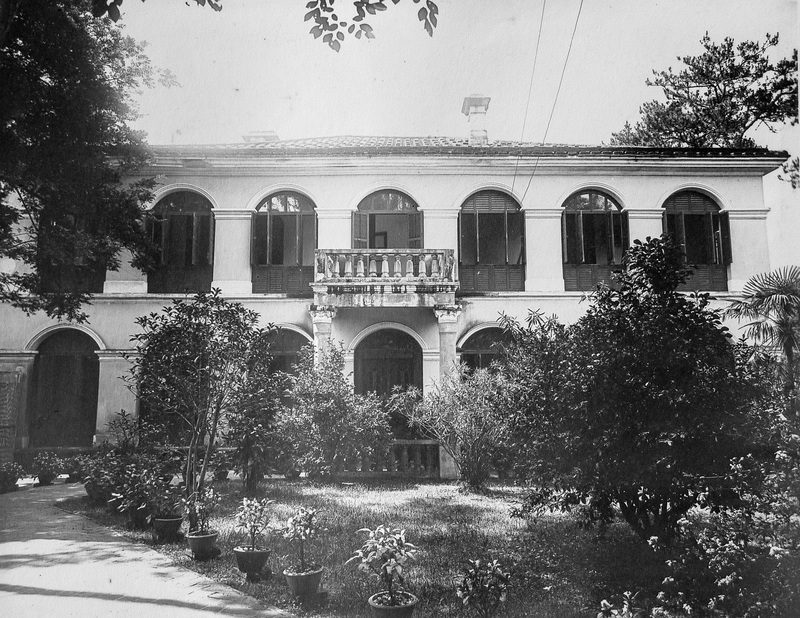 1918-19 - Foochow (Fuzhou), Fukien (Fujan) province. 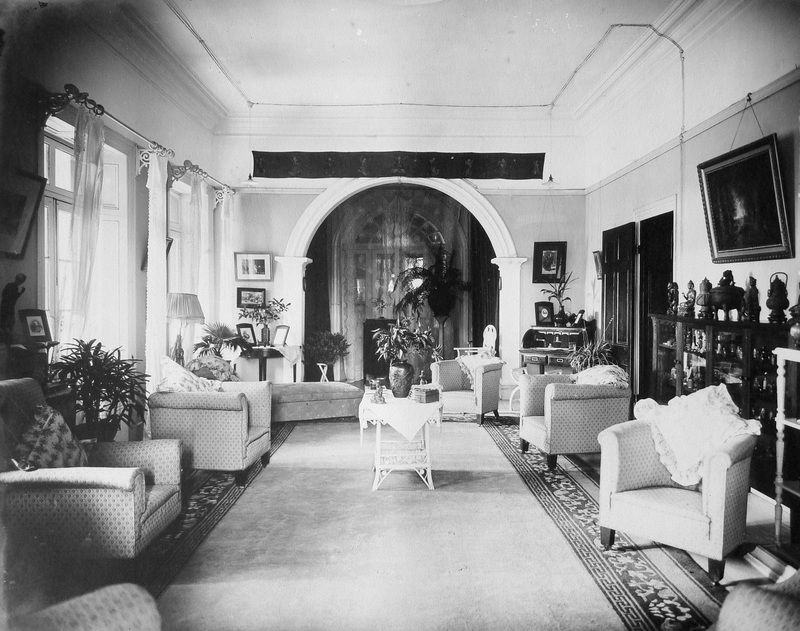 The main sitting-room in EC's residence. 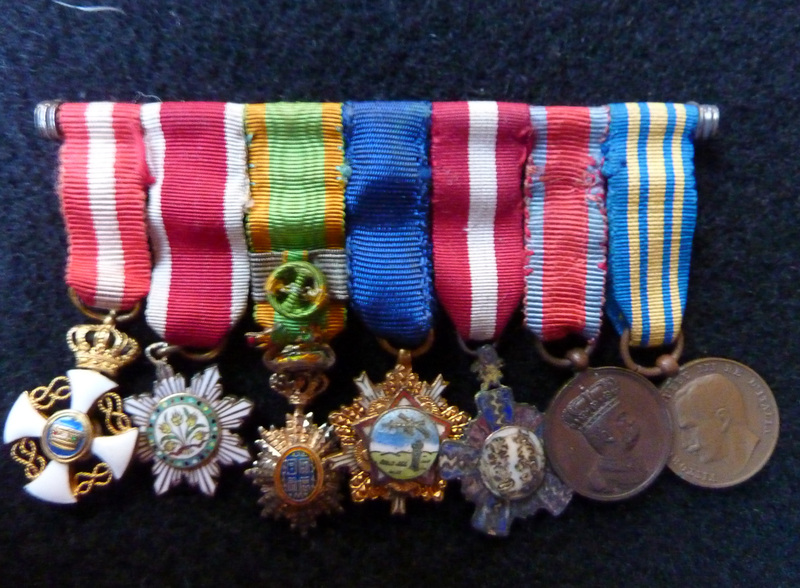 Many of the objects that can be seen have been in possession of the family ever since. To the left, a show-case contains a number of snuff bottles, thus confirming that EC started his collection some time before this, most probably while at Changsha (Hunan prov.) 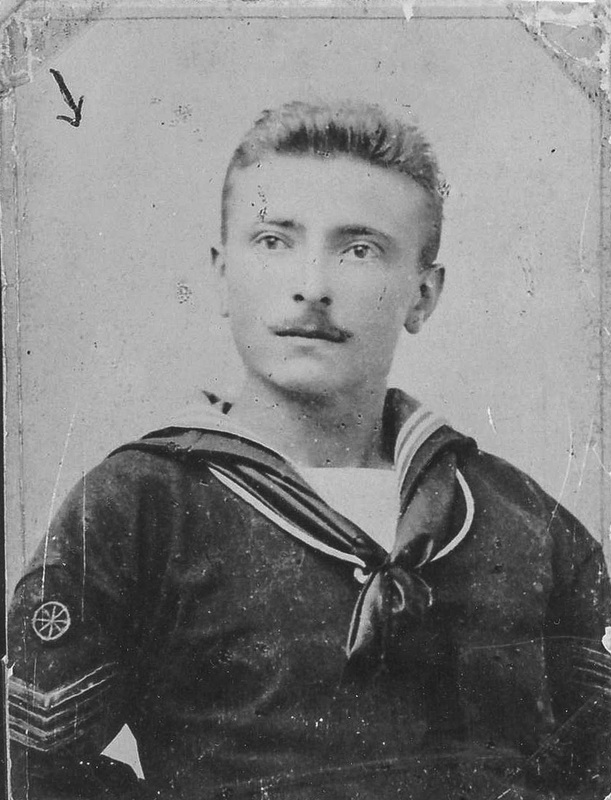 in 1914-15. 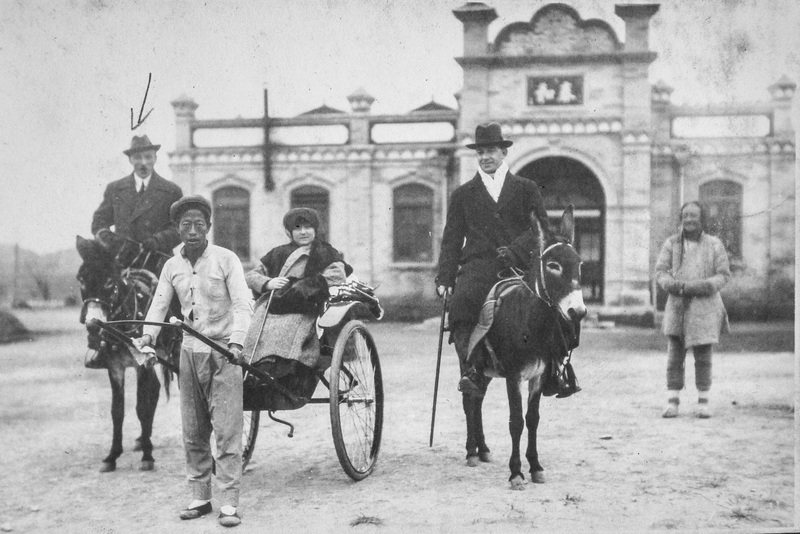 1918-19 - Foochow (Fuzhou), Fukien (Fujan) province. 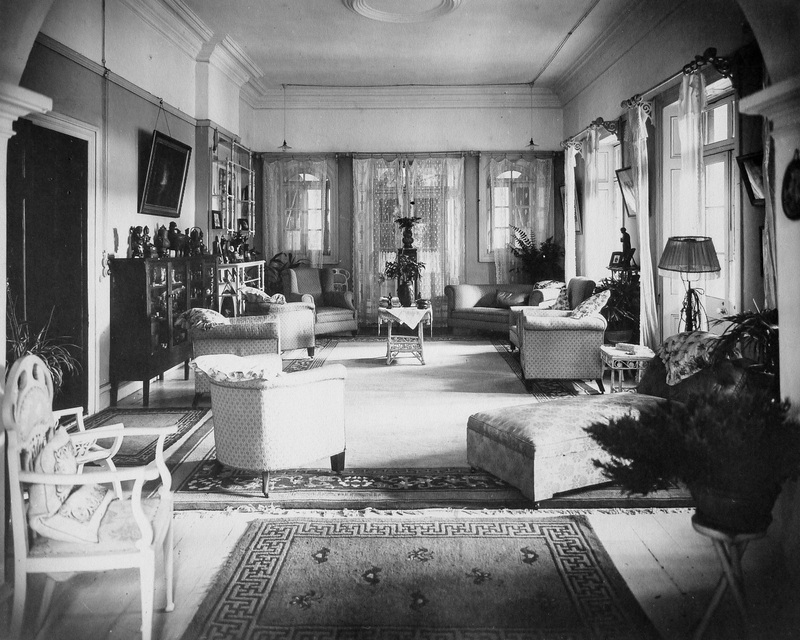 Opposite view of the same sitting-room as in Photo U, in EC's residence. Looking carefully at the same show-case, now on the right, one can make out several snuff bottles. 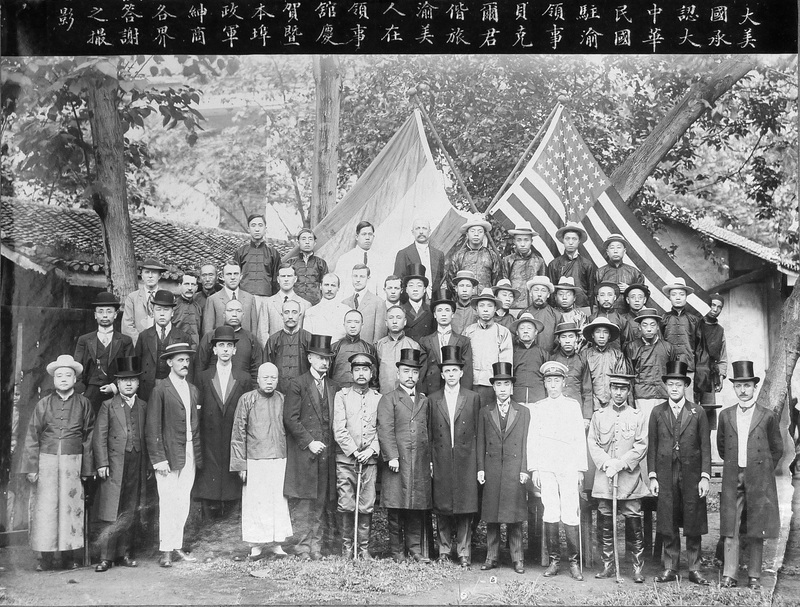 Foochow (Fuzhou), Fukien (Fujan) province, August 31, 1919 . Republic of China, 8th Year. 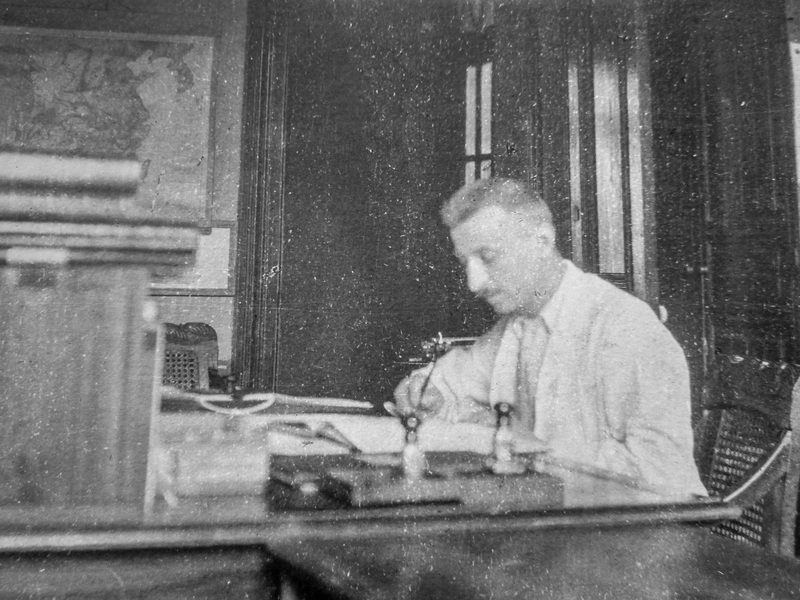 EC, about to depart for Italy on home leave, sits for a farewell ceremony with his replacement and local Post Office staff. 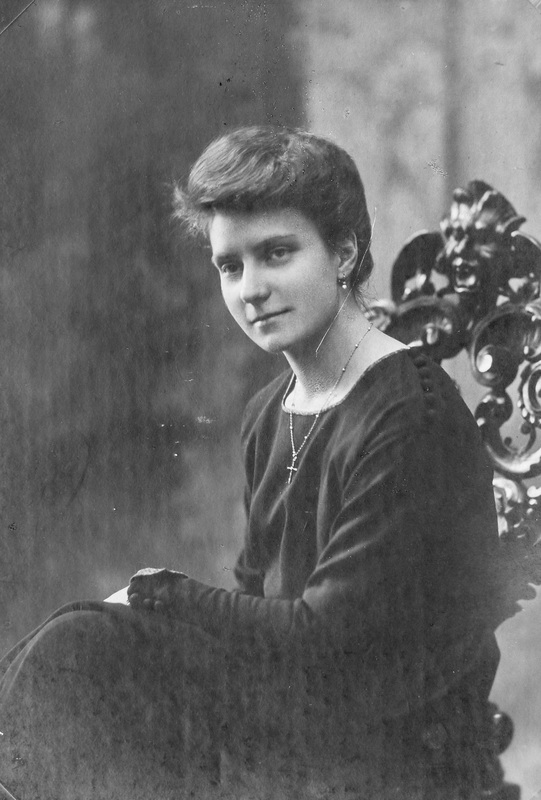 1918-19 - Milano (Italy) Giuseppina Colombo, EC's bride-to-be. 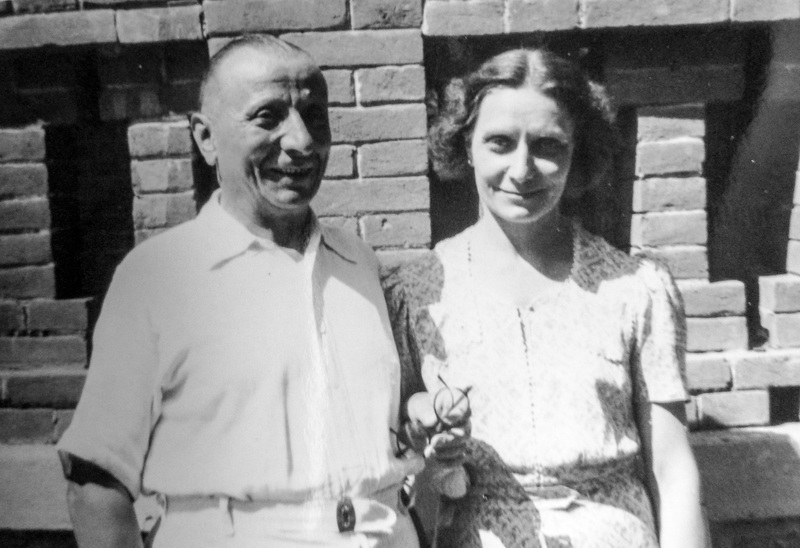 The couple were wed at Milano in 1920. 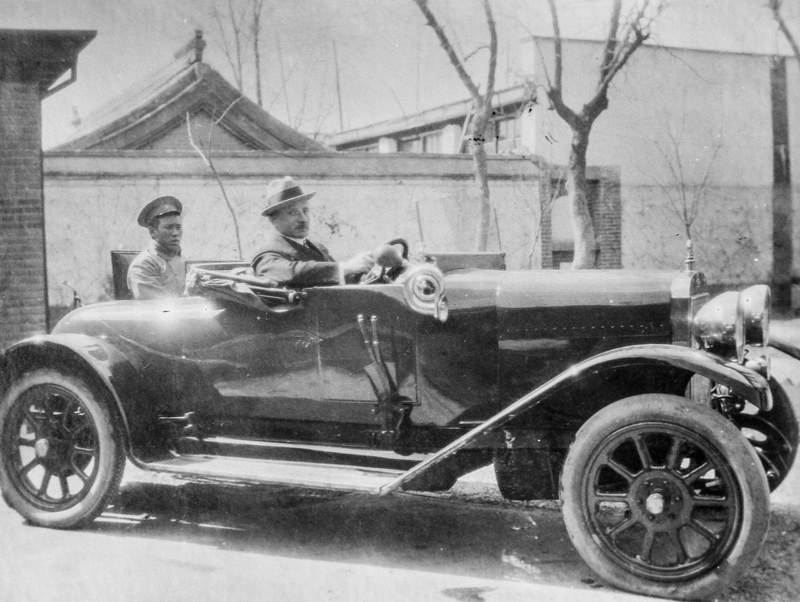 Peking (Beijin), 1921-22 - EC with his car, one of the few then in Peking, in front of his residence. 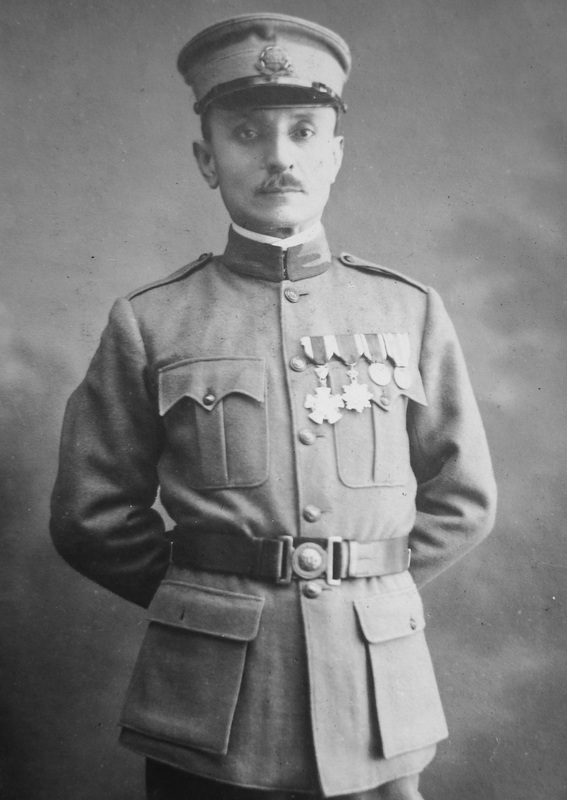 1923 - Shan Hai Kwan (Shanhaiguan) Hebei pprovince. 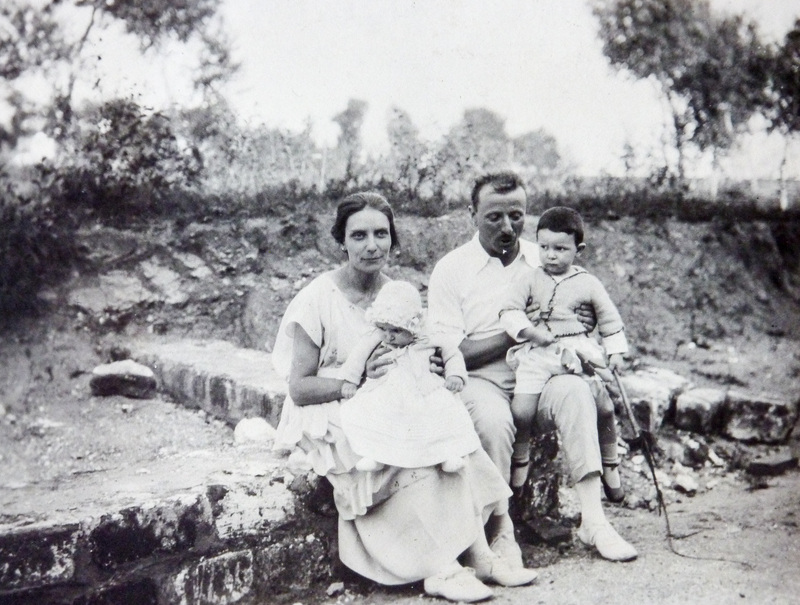 EC together with wife, son and daughter, pictured in summer at the sea.side..
1925-28 - Tsinanfu (Jinan), Shantung (Shandong) province. 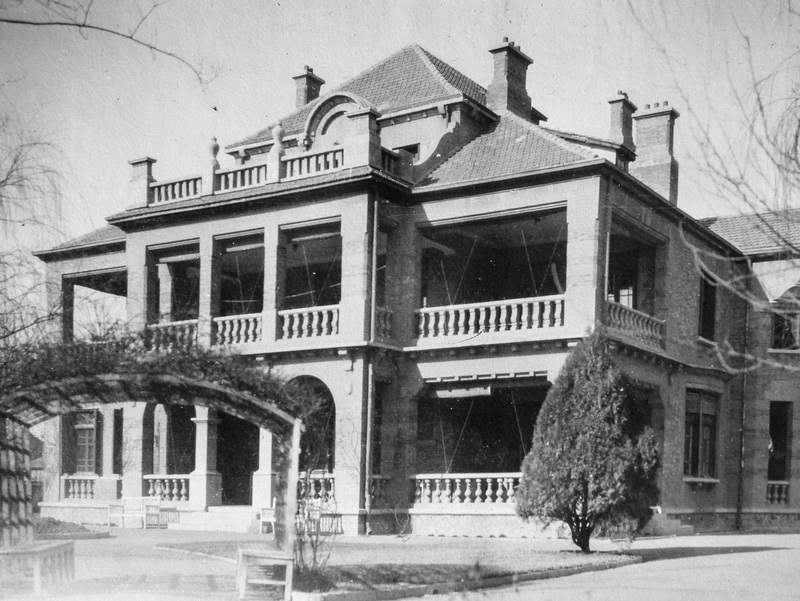 The residence of the Postal Commissioner, home of EC & family during his tenure. Over 300 snuff bottles of the Ko Collection were acquired here. 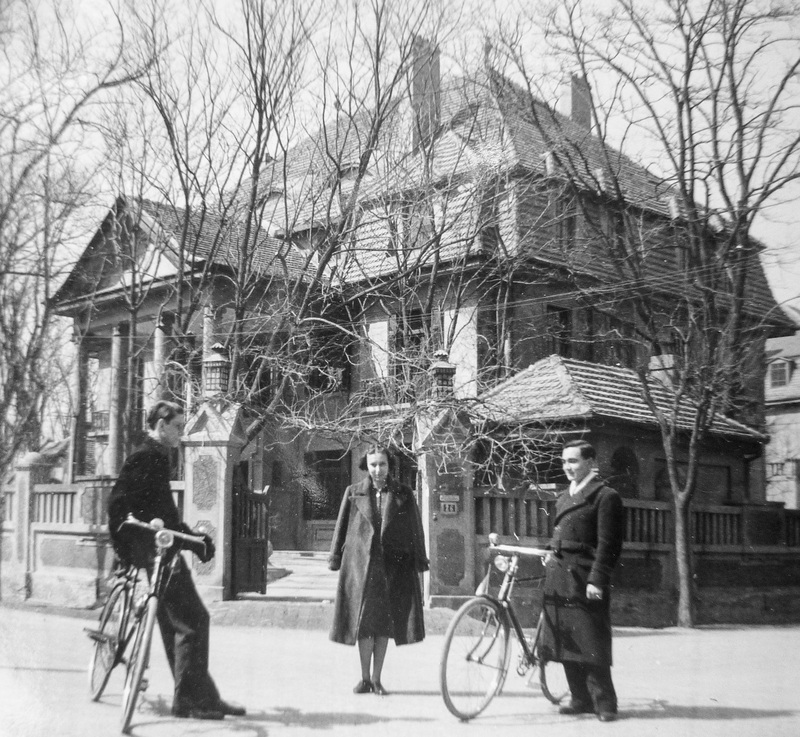 1937-43 - Tientsin (Tianjin), then Hopeh province. 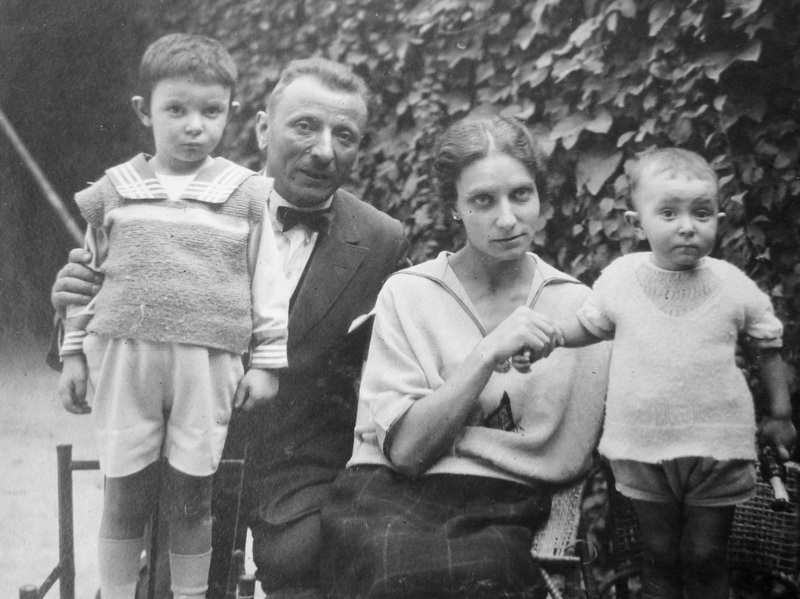 EC''s son and daughter, pictured with a friend in front of the Postal Commissioner's residence. 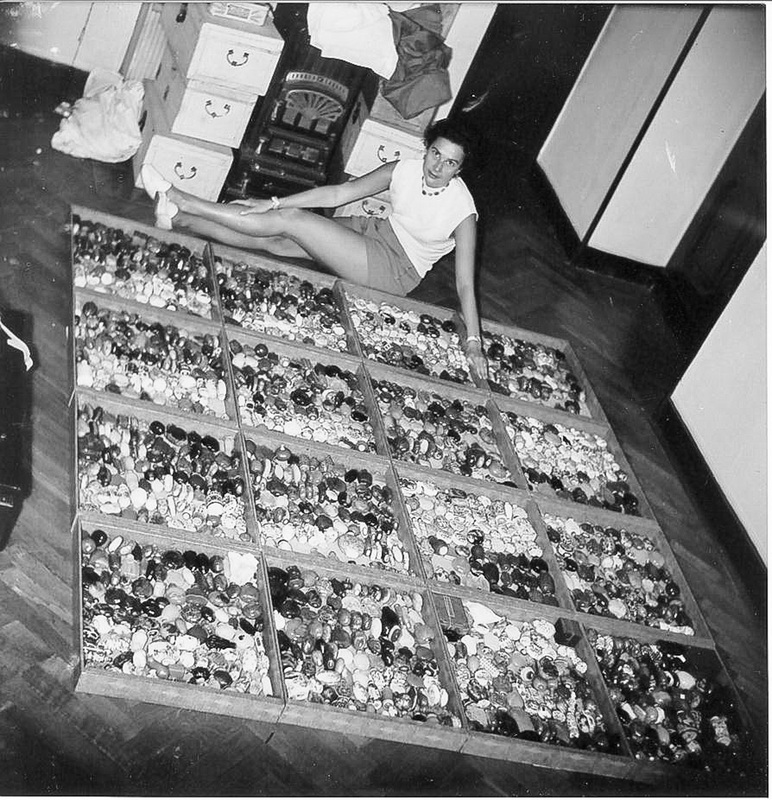 Nearly 300 snuff bottles of the Ko Collection were acquired during this period. 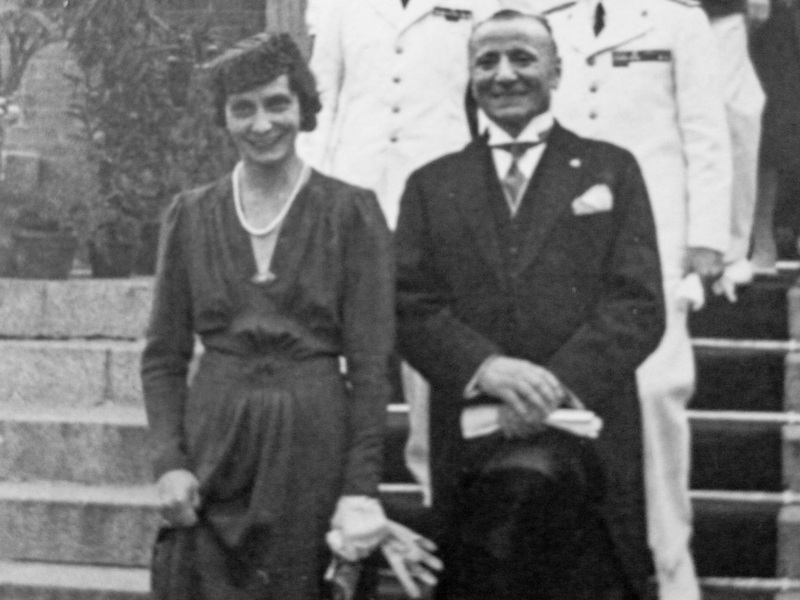 September 1942 - Tientsin (Tianjin) Mr. & Mrs. E. Caretti, on their daughter's wedding day, exiting from the church in the former Italian Concession, at the end of the ceremony.